If you guys have been reading the blog for a while, you know that Sonia and I love pumpkin (especially Sonia)—and furthermore, despite a recent review or two, that Russ is a pumpkin-hater. On an upcoming podcast episode, though, he makes the very valid point that there are many delicious non-pumpkin items that appear on the shelves of "Pumpkin Joe's" this time of year. This quality product is a prime example of something that might slip through the cracks if you're wearing those pumpkin goggles too tightly. But not to worry, there's pumpkin in it. It's not strictly a pumpkin product, though. Similar to the recently-reviewed Harvest Salsa and some other pumpkin salsas we've seen, our favorite over-sized orange gourd is blended seamlessly with tomato and butternut squash, among other things. Despite tomato puree and pumpkin puree appearing above butternut squash puree on the ingredients, I still think this tastes more like butternut squash than anything else. Flavor-wise, it's savory, subtle, and it's absolutely scrumptious. There's a beautiful mixture of spices rounding out the taste, including garlic, rosemary, cayenne pepper, and sage. It's a very mild spiciness, though. As far as texture goes, it's not too thick, and not too thin. 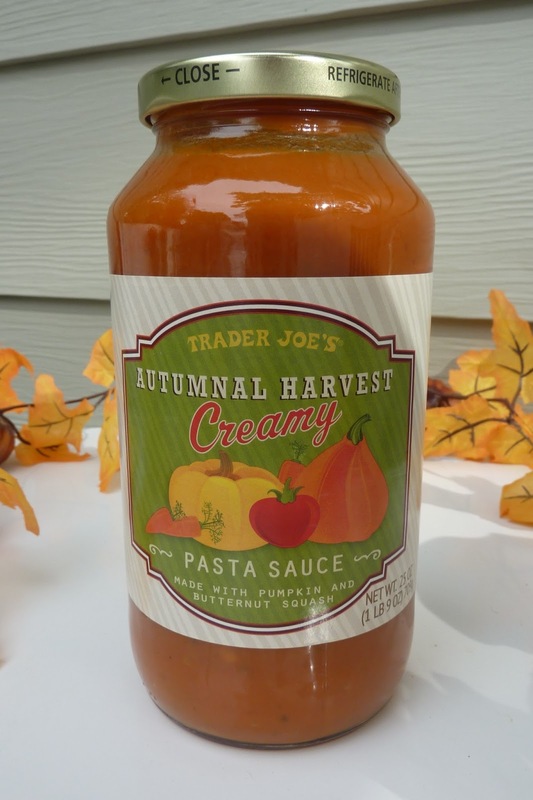 It's very creamy and smooth, but the creaminess doesn't get in the way of those harvest veggies, in terms of flavor. Sonia pointed out that some "creamy" sauces have too much cream or milk, and they wind up tasting like a dairy product instead of a pasta sauce, but not here. This stuff is well-balanced in every way. Sonia thinks it would make a great pizza sauce. I can see where she's coming from—if you wanted to try a do-it-yourself "Autumnal Harvest Pizza," this would be the right place to start. But for now, I think I'll stick with pasta. 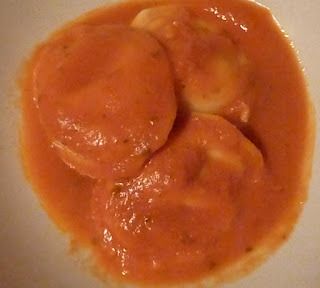 We had it with some non-TJ's cheese ravioli. It worked perfectly, with the majority of the flavor coming from the pasta sauce, just slightly overshadowing the mostly-neutral tastes of the dough and the cheese blend in the ravioli. I'm really anxious to get to some pumpkin reviews, but this was a condiment I just had to tell you guys about. If you're into traditional harvest flavors, butternut squash or pumpkin soup, this is a must-try. Four and a half stars from Sonia. Four stars from me. Cooked pumpkin tastes a lot like squash (ok, it *is* a squash!). Don't confuse pumpkin with pumpkin spices, which overwhelm so many TJ products this time of year. BTW, saw this and the pumpkin salsa the other day. Decided to try 1 of the 2 and went with the salsa, which is very good (and no hint of pumpkin spice!). I will be trying this soon--prefer creamy pasta sauces and this sounds like a nice balance. Why doesn't it say GLUTEN FREE when wheat is not listed as an ingredient and it doesn't say made in a place shared by wheat.....? Nonetheless, it is DELICIOUS! and out of stock at my Trader Joe's with more expected by the end of the month! Wish it was a bit cheaper, $3.99. That seems high. Just tried the sauce. Yum. Want to try it on pizza & lasagna. Wish we had a Trader Joe's here. Just tried this and love it. It tastes like tomato soup to me, though. (Not a bad thing--I love tomato soup) In fact I was wondering if anyone has added some chicken broth and tried it as soup?